Effective Wednesday, Oct. 3, Kristin Cobos will move into the full-time position of Writing and Online Writing Center Coordinator in the Academic Resource Center (ARC). Carolyn I. Brown, who is now the Assistant Director of the ARC, previously filled this role. Cobos has been an English as a Second Language (ESL) Specialist in the Writing Center for about three years and has added her ESL expertise to the ARC and Webster community. She holds a B.A. in International Relations from Webster University’s Leiden campus and an M.A. in Teaching English as a Second Language from Southern Illinois University at Edwardsville. 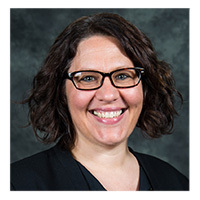 Cobos has more than 14 years of experience as a supervisor, instructor, and professional tutor.In her new position, Cobos will be responsible for the Writing Center, the Online Writing Center, and the annual Freshman Writing Award. Brown will continue to oversee the Academic Integrity Awareness Program, the Plagiarism Prevention Program, and the Testing Center. “I am looking forward to my new role as Writing and Online Writing Center Coordinator and future collaboration in a dynamic environment, supporting students on their path to graduation,” Cobos said. Cobos will be meeting with many departments and individuals as part of her on-boarding and training process. The ARC encourages staff and faculty to reach out to her as well. Cobos' office is located in the Academic Resource Center, Loretto Hall 40. She can be contacted via email at kristincobos14@webster.edu.